Whether your cat has long hair or short, grooming is a necessity: not only for cosmetic reasons, but also as part of a healthy maintenance program. You can avoid many hairball issues, stimulate your cat’s blood flow to the skin and hair growth, and most importantly, spend some good bonding time, by grooming your pet on a regular basis. wait a couple of weeks for him or her to settle in before you embark on a new experience. 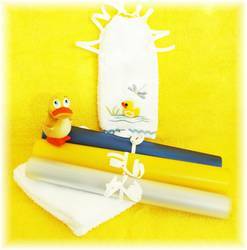 You’ll want a sturdy rubber mat, such as a bath mat or even a rubber place mat, to place on your counter or table. This will keep your kitty’s claws from scrabbling wildly against the smooth surface. Your cat will feel much more comfortable if he or she is stable and secure, and your surfaces will remain cat scratch-free. The type of brush you should buy will depend on your cat’s fur type. If your cat has long fur, a pin brush is best for working through a long, dense coat. If you have a shorthaired cat, a flat slicker brush will remove dirt and excess hair. We also use the triangle shaped slicker brush for smaller areas around the face and ears - a must for a kittens and cats. If you are training a kitten, most pet stores sell baby brushes, similar to what you would use on a young child. A fine-tooth comb will help remove fur that has been brushed loose on a shorthaired cat, while a wide-toothed comb is appropriate for longhaired felines. Our metal Greyhound combs top the list of our favorite grooming tools. Pet stores mainly sell one type of nail trimmers specifically designed for cats. Guillotine-style clippers, despite their creepy name, actually work quite well. Once you are practiced in getting your cat’s nail through the hole, trimming is a snap. All possible care should be taken not to cut your cat’s nail to the quick, but if you do nick them, have some styptic powder on hand to stop the bleeding. 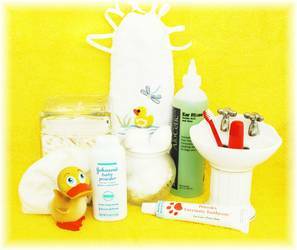 Rounded scissors, cornstarch, cotton balls, a cat toothbrush and toothpaste, ear-cleansing solution, cotton swabs and a chamois cloth are a few extras that will come in handy during your grooming routine. Place your rubber mat on a surface that is waist-level, such as a table or countertop, so that you don’t have to strain your back. Lay your cat on the rubber mat, facing away from you, and take a firm grip on the scruff of his or her neck. Hold your cat just tight enough so that he/she doesn't escape but don’t grip them tight enough to bruise. Using the slicker brush, begin at your cat’s head and slowly work your way to the tail. Brush your cat all over, but be careful around sensitive areas such as the ears and tummy. Using your fine-tooth comb, repeat the process. This will remove any dirt and undercoat that was loosened during the first brushing. When you’re finished combing, run your hands over your cat’s coat to so that it will lay flat. This portion of the grooming is soothing, but serves the added purpose of detecting any parasites, injuries, or unusual lumps that can be a sign of illness. Some groomers also recommend ending your grooming session with a rubdown using some type of velvet material or chamois cloth. This should give your cat’s coat a nice, glossy sheen. After your kitty is relaxed and shiny-smooth, move on to the nails. Carefully, working on one paw at a time, clip the nails with the guillotine-style clippers. If you’re more comfortable with them, you can also use large toenail clippers (the people kind). Don’t trim the nails too short, since just taking the sharp tips off is all that is necessary. If by accident you do cut too short and your cat begins to bleed, reassure him or her and dip your cat’s paw into a jar of styptic powder or cornstarch to stem the flow. As a final step, use a damp cotton ball to wipe your cat’s eyes free of any regular discharge (out of the ordinary discharge should be checked by a vet). Clean his or her teeth with toothpaste and toothbrush designed specially for cats and last, make sure their ears are dirt-free. Don’t attempt to use a Q-tip or go any further into your cat’s ear than what you can immediately see, as you can cause serious damage – stick to a regular cotton ball, just to be safe. Sprinkle your cat’s fur with a little bit of cornstarch and work it in with your fingers. This will loosen up any tangles in the making. While doing this, check your cat’s fur for any knots that have already formed. 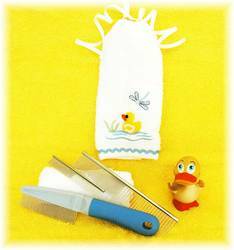 You’ll need to remove them with a pair of rounded scissors, but make sure that another person is available to hold him or her and you’ll avoid accidental nicks and cuts. Just as with a shorthaired cat, use your brush (the pin brush this time) and begin at your cat’s head, working back toward the tail. 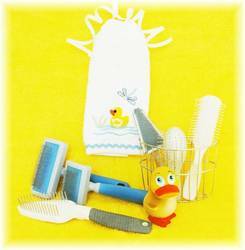 After you finish brushing, follow up with a wide-tooth comb. Section by section, work the comb gently from the tail, back to the head to remove all of the loosened fur. It will take time and patience for you to brush his or her tummy, but until you’ve reached that point, another person should be available to help. Taking the pin brush again, begin at the head and brush back to the tail to flatten the coat. 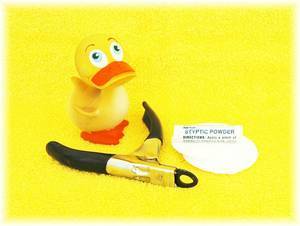 Smooth the fur with a chamois cloth, if you choose, and then move on to the face, teeth and nails. If you find that your new kitten resists the grooming routine, shorten the grooming sessions to give him or her time to adjust. Older cats, if unused to grooming, will take much more time and patience, but with plenty of encouragement, will soon grow to enjoy the process. helpless ball of fluff, to a regal and beautiful adult cat in our Kitten Development article. with our "Bringing Your Kitten Home" article.